Most of our day today was spent on the bus. 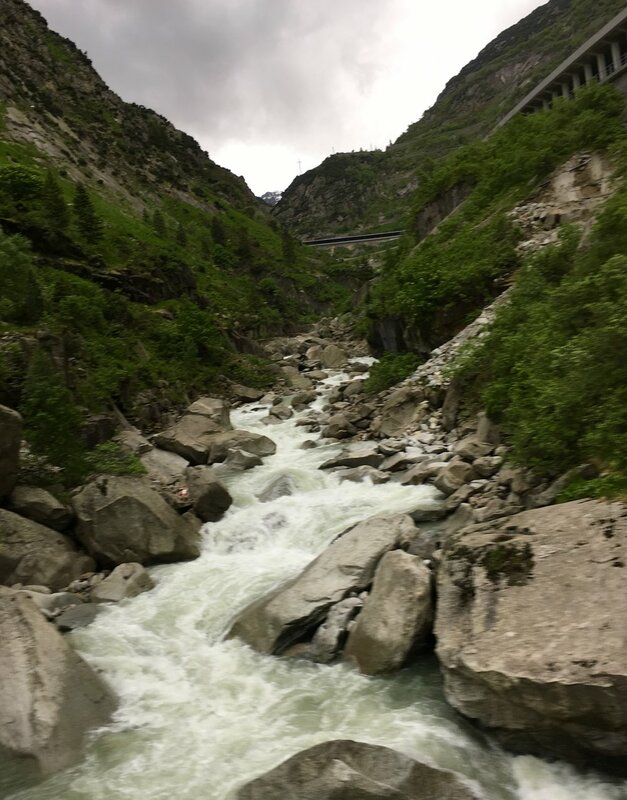 We left the Cinque Terre by train, back to the bus park in Levanto, and then started for the Alps again, but this time the Alps of Switzerland, not of Germany or Austria. We passed many small villages, homes, churches, and the like on the sides of the highways we travelled. Some of them our guide mentioned, some he did not. The image below was like many of the small towns we saw on our trip, but I do not have the name for this one. After quite a few switchbacks and hairpin turns, we got to a scenic overlook where the bus stopped for a few minutes. This view is of a pretty large lake which we had driven past. 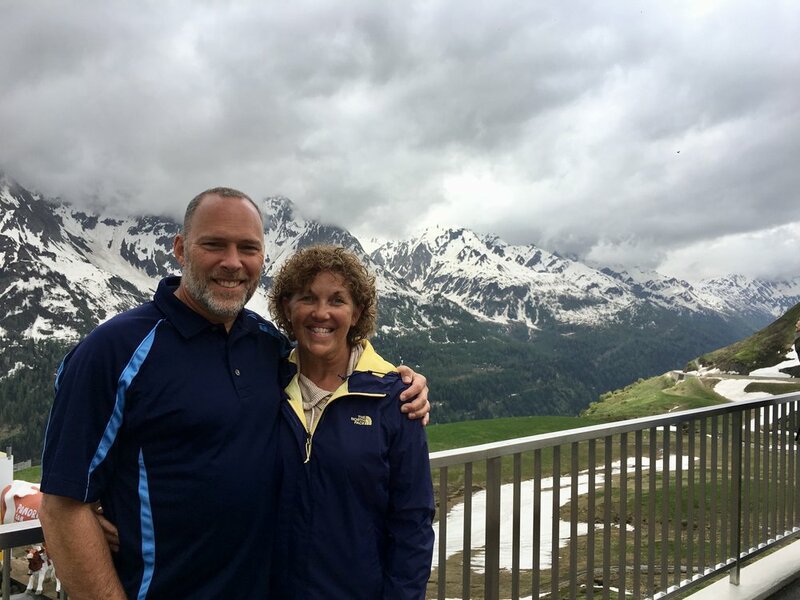 In just a few hours we had gone from the warmth of the Italian coast to the crisper and cooler air of this Alpine setting. 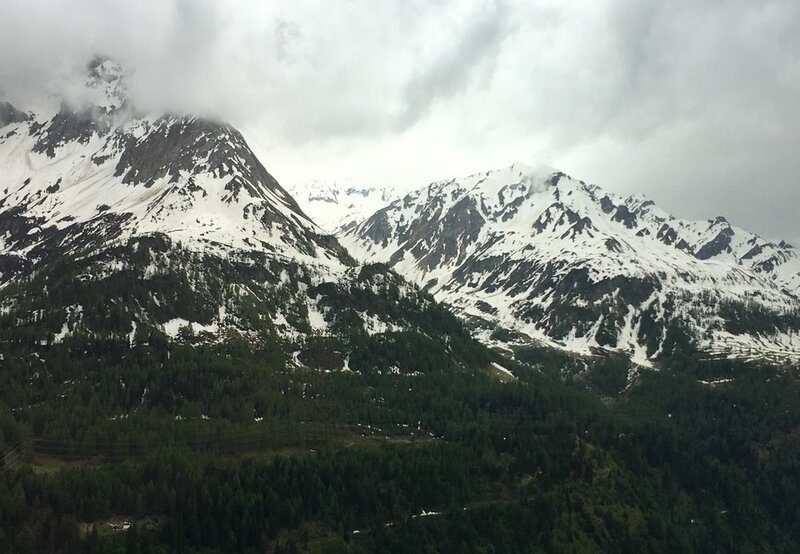 Up in these high passes, we spotted a goodly amount of leftover snow from the past winter, and there was no shortage of it above the tree-line. The views of the grand mountains were breathtaking. I don't know which peaks these are, but they are so beautiful with their snow dotted summits and swirling clouds of fog moving from one to another. What a great site to see! We found another high altitude pull-off, basically just a small parking lot along the road. But there was a small shop selling trinkets and some drinks. 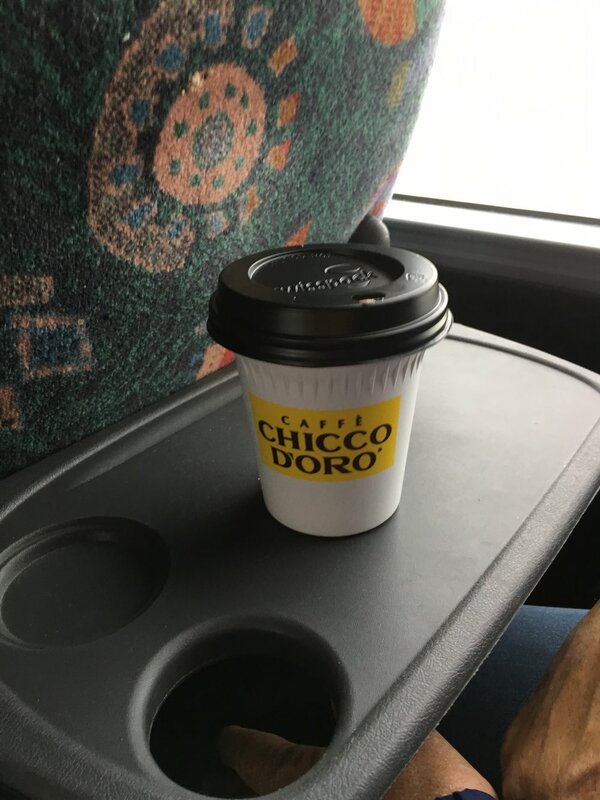 A secret friend bought Janice a cup of hot chocolate and left it in her seat on the bus. She was so happy. Of course, those who know her know how much she appreciates unexpected gifts of kindness like this, and she just teared up and was so sweet being thankful to whoever and everybody. We later found out the giver was our friend Ken (Eileen's husband). Small rivers like this one are fed directly from the melting snows from the tops of these mountains. 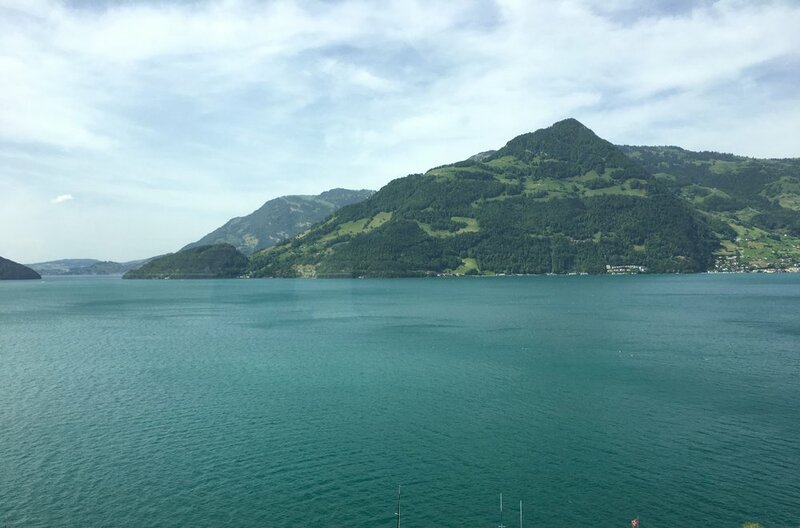 I am not sure, but this may be Lake Lucerne in Switzerland. 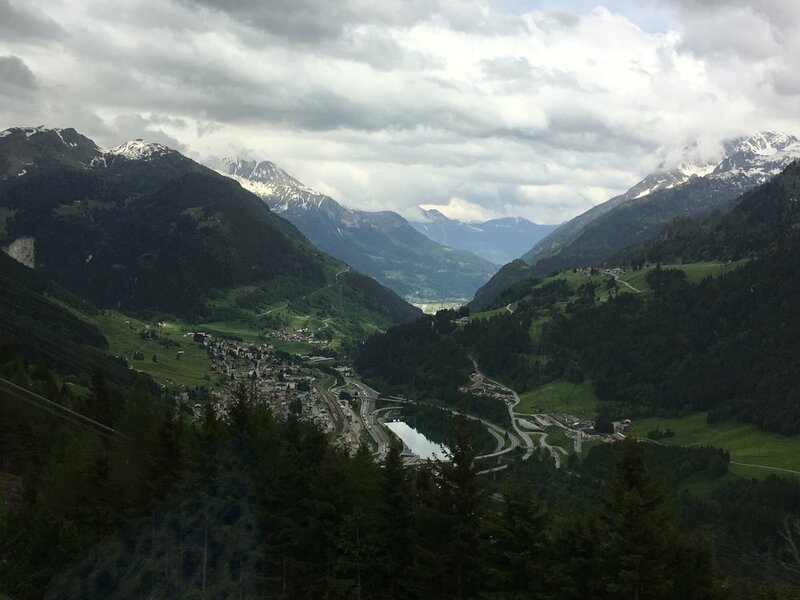 Another beautiful view on our long bus ride into Switzerland. 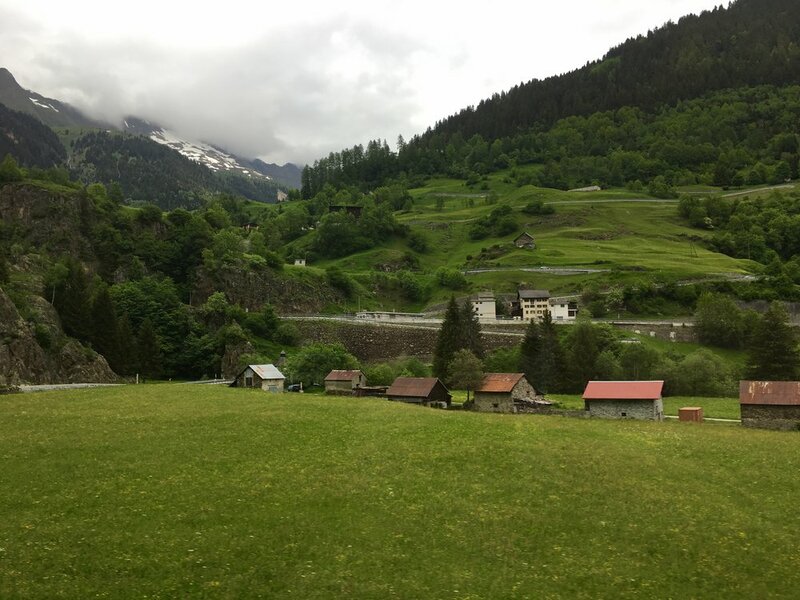 We finally arrived in the Lauterbrunnen Valley in Switzerland. 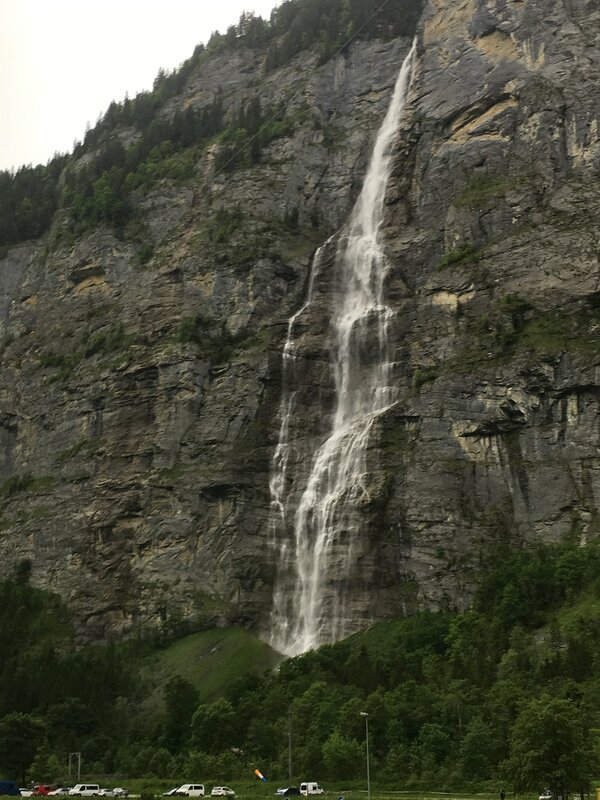 This is just one of over 70 waterfalls which can be seen in this valley, and it is very near to our hotel. This is the inside of room 32 where we spent two nights. Another of those glacial streams carrying water down from the mountain top snows. This is such a gorgeous place to visit! Otto is the owner and primary worker at the Stechelberg Hotel. Our first night here, as part of our dinner, he gave a fondue demonstration. I think this is the first time I've had fondue. And if I'm wrong, I'll modify my statement to say that it's the first time that I've had fondue in a valley in Switzerland!